By simply glancing around, your house will likely reveal how many products would fall under the hazardous waste category. Items like bug spray cans, batteries, fertilizers, oils, paints, varnish and even nail polish removers are considered as HHW or Household Hazardous Waste. Disposing these wastes directly to the dumpster is a big no-no! You should never throw them in the toilet or sink either. These materials contain hazardous waste and improper disposal can pose significant health, safety and environmental risks. Here are some tips in packing household hazardous waste for disposal. Store all liquids in their original container and make sure to seal their lids tightly to avoid spillage. If the waste is not in its original container, make sure you label them accordingly. Leaking containers should be placed inside a bigger container that can be tightly sealed. Do not expose flammable liquids under direct sunlight, heat, flame, spark or ignition. Separate them from other hazardous waste as well. Keep all containers upright and do not tip them over especially during transport. You must never use plastic bags to contain HHW. There are certain public facilities where you can drop off all your hazardous waste all year round. This is open to all residents who want to get rid of their unused harmful wastes. You just have to pay a fee for you to be able to drop off your trash there. 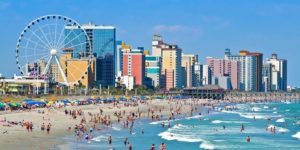 On occasions, dumpster rentals and waste management providers like us partner up with the local municipality to help the residents of Myrtle Beach, SC get rid of their HHW free of charge. We go to certain areas and stay there for 8 hours to collect the HHW of all the residents. At the end of the day, we dispose all HHW appropriately and accordingly. Some waste management companies and dumpster rental services offer personal HHW collection. Once the customer avails for our service, we deliver a small dumpster where they can throw all their harmful household waste. We will then pick up the dumpster at the agreed time and date for proper disposal of the products. This option is a pay-per-use package and is usually provided for free for larger renovation projects. The best way to get rid of these wastes is to use them up or give it away to a friend or a neighbor who can possibly use them, if you did not finish them. But it is not always that you find people who need these products. So the best solution is to ask where the household hazardous waste collection sites in your community is. Although many of our household products today contain harmful chemicals, there are still natural products in the market that can compete with the industrial cleaners we typically use. If you must absolutely use these harmful chemicals, please make sure to purchase the smaller containers so as to prevent throwing out excess products. If you buy less, you will dispose less. You must never burn hazardous materials as doing so can cause fire and explosion. This is a terrible approach of throwing away your HHW. Furthermore, it contributes to air pollution. Some of the typical household hazardous waste can actually be discarded in a dumpster. Before you go ahead and start dumping HHW, please contact the company beforehand at 843-459-7281. Some of the accepted wastes are motor oil, medicine, garden fertilizer and other sprays. Ask our dumpster rental company on how we will help you dispose of these materials in the dumpster.